Mom died one year ago. When she died, we sorted through all of her clothes and divided them into two categories. The first category was the clothes that I wanted to keep, either because I was going to wear them or because they had a special meaning for me. The second group was the clothes that we planned to give away to people who needed them. We made three bags of these. My family members dropped off two of the bags at the second-hand clothing store. I promised that I would take the final bag and drop it off … soon. My plans changed. I could not part with the last bag of clothes. For the whole year, I kept that bag in the trunk of my car. There was no room for anything else. Every time I started to put something in the trunk I remembered that the bag of clothes was there. I needed to have those clothes close to me while I was on the road. It gave me comfort to know that her things were with me. I never felt guilty or silly for keeping them with me. It just seemed right. Recently, I decided that one year was long enough to keep those clothes. On the first anniversary of her death, I dropped off the bag of clothes, except for one item. I kept her terry robe for use in my car. It keeps the sun off my legs and keeps the seat cool when I am not in the car. I have found a way to move toward a less cluttered, less encumbered, car and life. Keeping one piece of her clothing is enough. It is both practical and comforting. Mom was a very practical person. Growing up through the Depression, she did not waste anything. I think that she would be pleased to know that other people are wearing her clothes now. I think she would also be pleased to know that I am learning and able to move. The lesson of my story is simple. 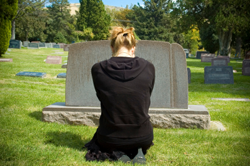 Listen to your own heart about how to deal with grief, loss, and moving on. The only schedule that matters is the one that you discover for yourself. Don’t let others tell you, or make you feel guilty about when it is the right time to let go. Only you will know that, and when you do, everything will be fine. Mary Bart chairs Losing Our Parents, a registered charity. As her parents’ principal caregiver for ten years, Mary has first-hand experience in helping aging parents, dealing with family dynamics, and working with public and private organizations. Her father died of cancer in 2005 and her mother died of Alzheimer’s in 2008. Losing Our Parents is an internet-based community that offers support and education to people who are coping with the declining health or death of a parent. “Losing Our Parents” was formed by a volunteer Board of Directors composed of business, health, and social work professionals. The Board developed a strategic plan that will help people all over the world through its interactive website and organized group retreats. We invite and encourage people from all countries and backgrounds to share, learn and support each other. “Losing Our Parents” is after all a universal, timeless issue. Reach Mary at www.losingourparents.com.